GEC Instruments designed and built four 94 channel thermocouple instruments to measure small temperature variations at a multitude of positions on the primary/tertiary mirror on the Large Synoptic Survey Telescope to be located atop Cerro Pachón in the Chilean Andes. The LSST system will combine a wide field of view, rapid scans of the sky, and deep-imaging capability to map billions of objects and monitor changes in brightness and position. Our standard 4 channel type T thermocouple instrument, Model S4TC, and our standard 16 channel type T thermocouple instrument, Model S16TC are normally in stock for immediate delivery. We also build custom instruments with type B, E, J, K, N, R, S or T thermocouple inputs and with up to 94 channels in the same enclosure. 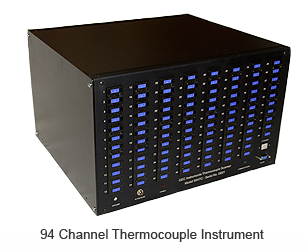 And we can provide differential thermocouple inputs for very accurate measurements of small temperature differences. 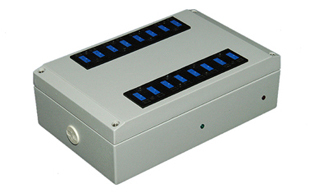 These units include a 6' serial cable, versatile Windows software, and a 2 year warranty. They may be connected to a USB port via a USB to RS232 adapter. Type T female miniature thermocouple input connectors. Resolution of temperature measurement: 0.01 °C (0.018 °F). Reference junction accuracy (cold junction compensation) typically 0.003 °C (0.005 °F) or better on all channels. Accuracy of temperature measurement: If the instrument is operated in an ambient of 15 to 35 °C, instrument accuracies better than ± 0.1°C (0.18 °F) can be attained over the measurement range of -10 to 100°C. Very high accuracies can be attained at higher and lower measurement temperatures as well. This specification includes all instrument errors including reference junction error. Total system measurement accuracies (including thermocouple wire error) of 0.05 °C (0.09 °F) or better can be attained through a software calibration of thermocouples by comparison with a known temperature standard at two points. Click here to see some data. Accuracies of 0.02 °C (0.04 °F) or better have been attained over -10 to 140 °C by multiple point calibration of individual thermocouple wires. Click here to see some data. Superior uniformity between thermocouples of 0.01°C (0.018°F) enables accurate measurements of small temperature differences. Built in auto zero eliminates system offset errors. Both 50 and 60 Hz. noise rejection are available. Scan rate: 2 to 10 channels/second, depending on desired resolution. Size: 3" high x 9" wide x 5.5" deep. Sturdy die cast aluminum case with light grey powder coating. Communications protocol: RS-232, 9 pin female serial connector. Options: Additional thermocouple channels, precision high accuracy (0.002 to 0.004 °C) high resolution (0.0002 °C) thermistor probes, 4 to 20 ma inputs, relative humidity inputs, custom thermocouple calibrations. A one page specification sheet and copies of the hardware and software manuals are available here.